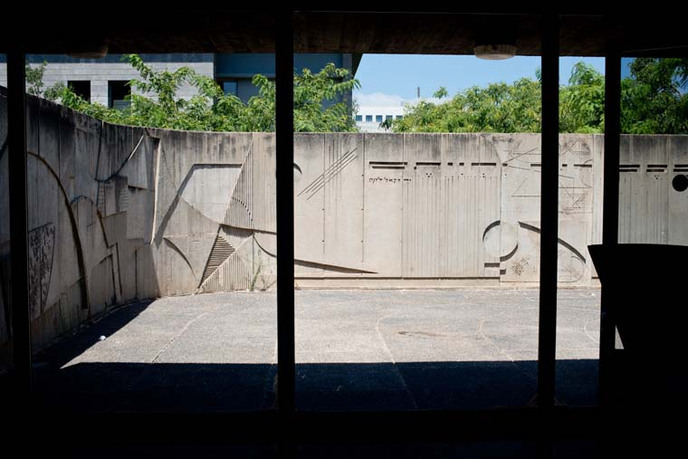 Shlomo Eliraz, Community center, Herzliya. 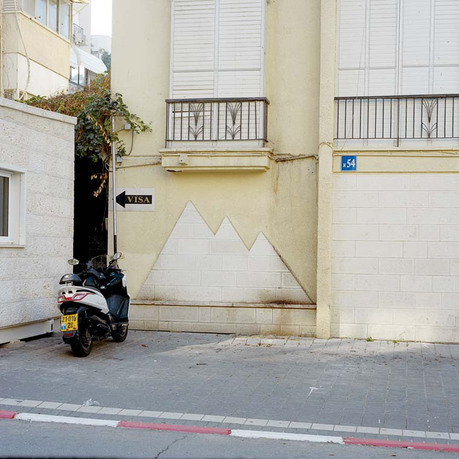 Photo: Assaf Evron. At the contemporary decline of the social democratic state, and the erosion of democracy itself, the exhibition examines the Israeli city of the 1970s. This ambiguous historical moment set up a trajectory for the dystopian present, while at the same time encapsulated traces of an attempt to work towards a utopian horizon. 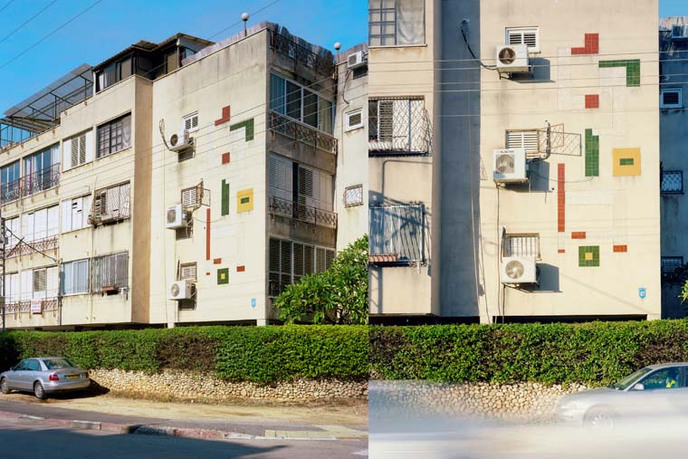 The exhibition focuses on Herzliya at large, as an archetype for the Israeli upper-middle-class city, and inquires into vernacular architecture’s adaptive ornamentation as a vehicle for the symbolic organization of social space. The works in the exhibition isolate and reactivate ornamental moments throughout the city, as well as within the site of the exhibition itself, as a sculptural environment. The examination of ornament in its local setting, suggests a hybrid variant, an interpretation, which results in a sculptural mise-en-scène that draws cross trajectories through the universal language of modernism, its histories, and its local manifestations. Assaf Evron is an artist based in Chicago and Tel-Aviv. Evron's work investigates the nature of vision and the ways in which it reflects socially constructed structures. He has exhibited his work internationally, after earning his MFA from the School of the Art Institute of Chicago. He received his undergraduate degree from the Department of General History at Tel Aviv University, and his MA from the Cohn Institute for the History and Philosophy of Science and Ideas, also at Tel Aviv University. Between 2003 and 2009, Evron was a staff photojournalist at Haaretz in Tel Aviv. 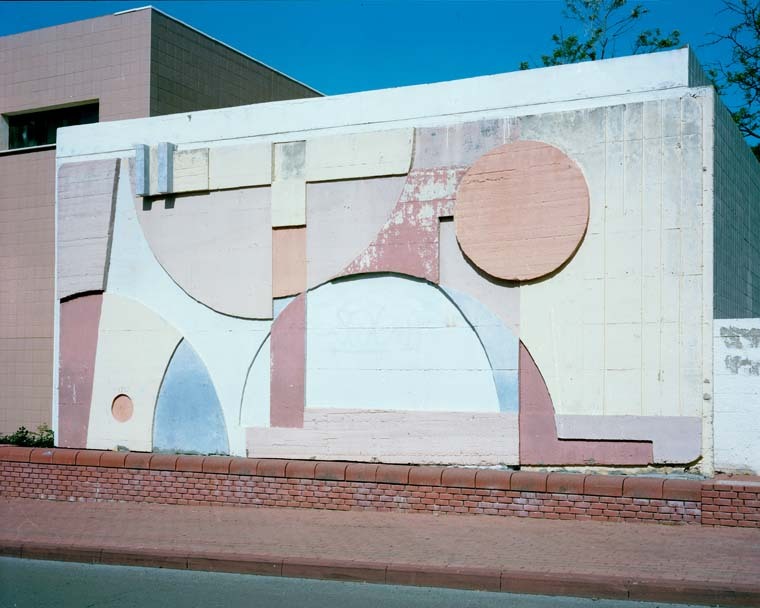 Among his commissioned works are those for the Chicago Architecture Biennial (2015), the Israeli Pavilion at the 12th Venice Biennial for Architecture (2012), the renewing of the Israel Museum in Jerusalem, and the Tel Aviv Museum of Art’s Dov Karmi exhibition.